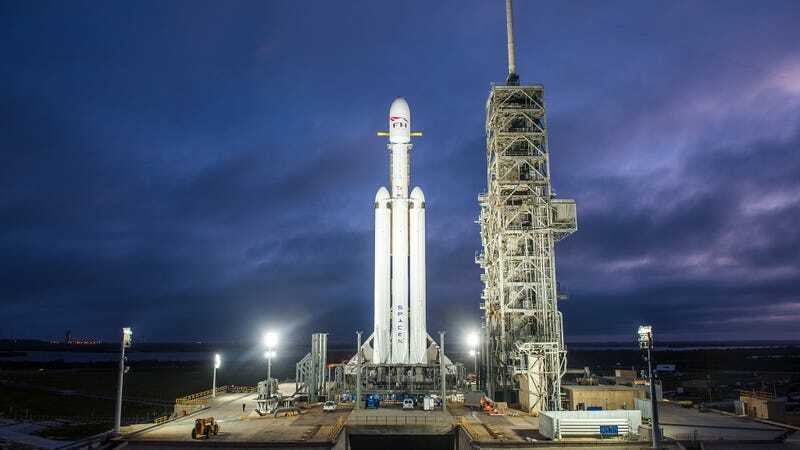 At approximately 1:30 pm ET on Tuesday February 6th, SpaceX’s Falcon Heavy rocket is set to embark on its long-anticipated debut flight. Capable of lifting 140,660 pounds to Low Earth Orbit, it will be the most powerful operational rocket in the world. 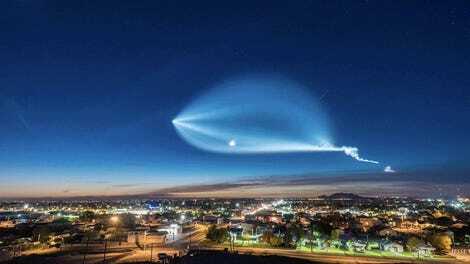 Well, that’s assuming it doesn’t blow up on launch or come careening back toward Earth—something SpaceX CEO Elon Musk says is a distinct possibility. Success or failure, here’s what you need to know about this historic launch. Once aloft and operational, the Falcon Heavy will be the most powerful rocket since Saturn V and the Space Launch System. Should all go well, the private rocket firm already has contracts lined up to deliver communications satellites for Arabsat, Inmarsat, and Viasat, as well as a payload named STP-2 for the U.S. Air Force. The giant rocket may even be used to send a space tourist around the Moon later this year. But that’s all contingent on a safe inaugural launch—something that’s far from a sure bet. Getting to space is hard, and SpaceX is no stranger to setbacks; on September 1, 2016, a Falcon 9 rocket exploded at Cape Canaveral, destroying a $200 million satellite in the process. The company’s CEO, Elon Musk, has said publicly that he wouldn’t be surprised if the Falcon Heavy experiences a similar catastrophic failure. No doubt, there’s a lot that could go wrong. The two-stage rocket will exert five million pounds of thrust at liftoff, the equivalent of 18 747 aircraft. Its first stage consists of a pair of Falcon 9 first stage rockets, which are attached to a central “core” rocket, itself a modified Falcon 9 booster. And like the Falcon 9, the Heavy is designed to be reusable. In total, the 230-foot-tall rocket will be powered by 27 first-stage Merlin engines, and a single second-stage Merlin. The central core is designed to handle all this stress, and it’s a major reason why the Falcon Heavy is more than three years behind schedule; the Falcon 9's core may be tried-and-true, but this one is brand new and untested. The Heavy can be reconfigured to lift various payloads, whether it be satellites to Low Earth Orbit (LEO) and Geostationary Transfer Orbit (GTO), or crewed missions to the Moon, Mars, and beyond. The rocket will be able to carry 140,660 pound payloads to LEO, 58,860 to GTO, 37,000 pounds to Mars, and 7,720 pounds to Pluto. For its first voyage, the rocket will carry a dummy payload consisting of Elon Musk’s personal Tesla Roadster. 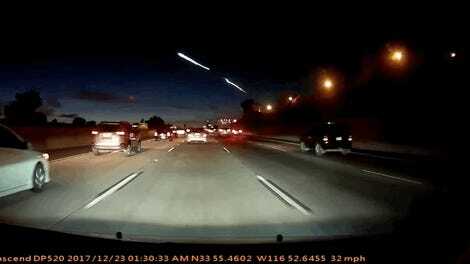 Should the rocket explode, it wouldn’t be the end of the world. Aside from the complete destruction of the Tesla Roadster (and possibly the launchpad), a failed launch would result in an investigation to determine the cause, followed by the required technical adjustments to make sure it doesn’t happen again. SpaceX is clearly in the business of making rockets, so if there’s an explosion, the company will simply pick itself up, dust off, and build again. We can’t be certain if the Falcon Heavy launch will be successful on Tuesday, but as Musk himself has said, “It’s guaranteed to be exciting.” Come launch day, you’ll be able to watch the launch via the SpaceX webcast. Correction: A previous version of this article conflated thrust with lift capacity.